Review| A Bird! No, a Plane! It’s a Dragon! “A desperate Knight. An imprisoned dragon. What will crossing fates of the two bring about? I have slain countless monsters as a Shirai Knight. I have gained great wealth and high status over many years. But so what? If I can’t even protect the one thing I truly care about, then it’s all meaningless. However, I will not give up. That is not an option. Not when I have one last hope of making things right. Dragon, I don’t know if you’re ready for me, but I’m coming for you. 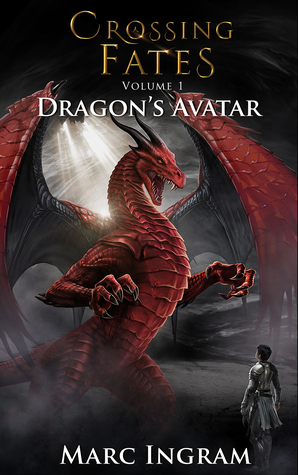 “Dragon’s Avatar” is the first book of the “Crossing Fates” series, an action-fantasy story set in a medieval world of magic and monsters created by the author Marc Ingram. I’m almost not even sure what I’m supposed to be reviewing, but, as always, I’ll give it my best shot. I don’t know what or where the plot was? The book just seemed to continue on and on without a real “end result”. There was an end result, but you don’t know what the end result is until you almost finish the book. If I’m not making any sense, it’s kind of like this: In dystopian books, the end result is often a successful uprising and the government is taken down. In sci-fi war books, there’s a war and the good guys win. Even in TV shows and comic books, the Joker is wreaking havoc and we already know that Batman is going to take him down and win. We already know the end result of the plot, it’s getting to the end result that makes the plot so interesting. But with Dragon’s Avatar, I had no idea what the main character’s (Lambert) goal was, so for me (until we neared maybe halfway into the book), it just seemed like he was ambling around trying to find a dragon for a personal ego quest of some sort. There was action, but the style of description wasn’t for me, and so it came off rather weak and wasn’t descriptive enough. This made it hard for me to imagine any part of the fighting scenes or even the regular scenery and that’s an important factor for me. I didn’t find it exciting and I didn’t feel any sort of suspense throughout the book like I have with other books focused on dragons and fighting. In previous reviews where I didn’t feel there wasn’t a plot, I tend to really chew the book apart. However, a difference between those books and this book, is that Ingram did this on purpose. After conversing with Ingram, he informed me that this is his writing style. While the book wasn’t descriptive, there were still a lot of words and that made the book feel too long, which brings me to the writing. This isn’t simplistic writing, but rather writing that doesn’t convey reactions properly, especially realistic reactions an adult would have. Would an innkeeper “roar” like that? Rather, do men really roar over every little thing in such a manner? Do you know how terrifying a man roaring is? It’s not something I would want to hear regularly and not something men do regularly. Other adults always being so shocked or surprised over ordinary things too, I didn’t get it. I had issues with repeated sentences and definitions too. Sometimes dialogue was repeated for no reason and it was honestly annoying. For example, the praise for Shirai knights was laid on too thickly. Some character would see Lambert, their eyes would widen, they would exclaim “You’re a Shirai Knight! ?”, and Lambert would reply “As you can see from the armor.” Over and over and over. I understood that Shirai Knights were supposed to be some amazing Knighthood almost immediately and I felt that there was no need to reaffirm it over and over. Another example was the narration always explaining how Lambert’s armor works. I won’t give it away, but every single time he put it on or took it off, the narration would explain how. After the second time, I wasn’t going to forget any time soon how the armor worked. My memory is very selective, but when I’m reading a book, I don’t forget the things I’ve read in that specific book. I’m a quick reader, but I don’t think that how quickly I read the book mattered very much. Unless I read part of the book and put it down for a straight week or two after learning each new concept, I didn’t need the constant repeated explanations and reminders. The lack of Point-Of-View (POV) labels drove. me. crazy. Maybe this was for some element of mystery and surprise, like a constant guessing game, but I found it frustrating to have to try to figure out what character is currently narrating for almost every chapter. I like to already know immediately, rather than be thrown into a sort of suspense as I put together the dialogue and action to find out what’s going on. I was left in the dark until I figured it out because the next “Act” (chapter) would come along and it would be in an entirely different POV than Lambert’s. There was also a rather confusing ending. I won’t spoil it in case you read it, but I didn’t like the method of presentation. I think that if I understood what was happening immediately, I would have enjoyed it more, but the lack of POV and the way I read made me discombobulated. I think that I didn’t like Dragon’s Avatar because Ingram’s writing style just doesn’t match with my preferred reading style, which happens. Would you Recommend Dragon’s Avatar? I personally didn’t enjoy it, so I can’t recommend it to anyone else. However, as always, what isn’t my cup of tea, might be someone else’s. I received this book for free from the author in exchange for an honest and unbiased review. Great review! I completely agree with the repetition thing. It’s always annoying to read a word or phrase over and over again. Especially when that phrase has many other, more appropriate replacements. And I’ve experienced a similar plot problem, too. It gets on my nerves every time. At any rate, negative reviews are always hard, but you pulled it off. Thanks for commenting! Negative reviews are hard when the author is respectful and kind. I don’t like to give an author a poor review for their book, especially if they requested I read it).